Over the course of Pam's stay, we've talked a great deal about food, and I've mentioned many regional things she said she'd like to try...foods they might not typically serve in England. As we were going to a friend's home on this evening for a lobster dinner, I was fixing side dishes to take along, both new to her. I know she'll be posting a lobster photo, so I leave that to her. This was lunch. 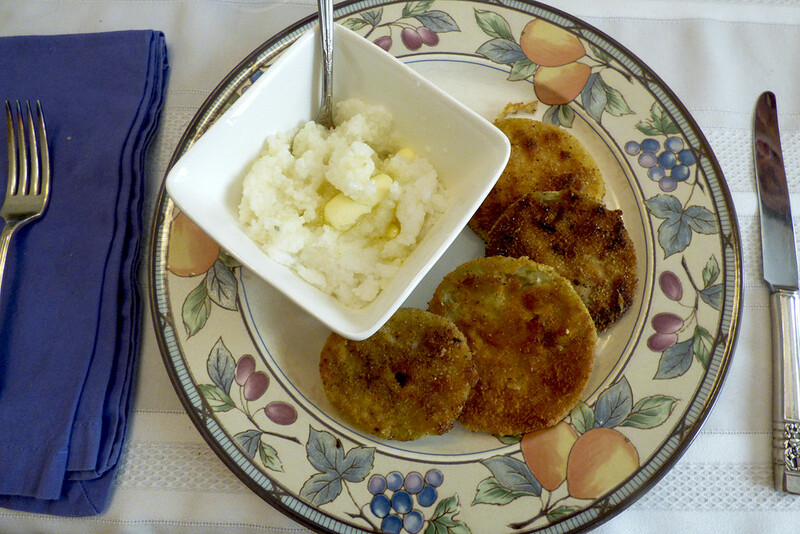 I made us Fried Green Tomatoes, a southern US meal, and thought it would be well paired with grits. Ken and I were delighted to have it again, and she loved i! I've also just made three flavours of meringues: coffee, dipped in a chocolate base, peppermint, and plain (as those were Pam's favourites). I made a batch of macadamia-nut cookies and chocolate-chip macadamia-nut cookies as well. Too bad she's not staying with me long enough to go shopping for new clothes! I've likely outgrown my wardrobe since she arrived, but oh, we've eaten well and enjoyed every minute! Bon Appetit ! I figured you'd still be posting around here! Looks like you're enjoying another season in Lunenburg! With more grandkids! Hope all is well ! Looking forward to another round of 365. @tjsworld TJ! Welcome Home! Yep, I'm still having fun at this, but often my days are so full, I have no time to even open the computer! Are you still in Texas? 4 grandkids now...the oldest turned 6 yesterday! Imagine! There aren't too many of us from those earliest days, but you'll find your stride again! I always liked your photos and will always remember that you saved my JW statue photo as a screen saver! God Bless America! We'll return in early Dec, but this has completely become my Heart Home! So nice to see you! Likewise! Congrats to you and Ken on those beautiful Grandkids! Seems like it was just a week ago when the first one arrived! I'm sure they keep you busy! Yes still in Texas living life to the fullest. So good to "see" you again! @tjsworld Thanks! We see "the blond grands" frequently as they live up the California coast. My brunette boy and and baby girl have just moved to MA, so we hope to start seeing more of them on our "six-month summers" up here. I hope all's well with your boys; I'm glad life's good for you! All is well, my eldest just started attending his freshman year in college at The Citadel in South Carolina, so I will be making frequent trips to the east coast. I'm sure to post alot of photos when I make m trips to SC. The youngest is now in 8th grade and quite the handful! I'll be sure to post photos of both very soon. Stay well and stay safe. Happy to be with you and the rest once again ! Yummy, my tummy's rumbling. Pardon my ignorance, what is/are grits? We have a very similar dish to your grits, know as pap (pronounced pup) made from maize (mielie) meal. I have never grown to like it. I would however like to try fried green tomatoes. It sounds like you had a fabulous time with Pam! That is so good to read - don't really know the usual cuisine for there apart from fish. Will look for Pam's thoughts which I know will be all good! What a great time you've all been having. I did laugh at the idea that you might need to buy some new clothes! Ha ha! The food all sounds and looks delicious! this makes me think of the time my brother, who travels all over the world, was amazed when we had biscuits and gravy for breakfast. Looks delicious Louise! Enjoy the rest of your visit! @pamknowler This beats all wouldn't you say? Like Ken says, "Mind Games"! What a delight! @golftragic Grits is a ground white hominy corn. It's a larger kernel than regular corn and makes a starch dish that can be paired or combined with any number of other foods. Back in California, I mixed grits with baked, mashed sweet potato and melted smoked gouda, and topped with the a savory stir-fried shrimp. We "Southern Gals" can't get enough of it! @peterday What fun it is, learning The Foods of the World! We had this because Pam was curious what it tasted like. I confess I won't know that tarte tatin is until I google it! @joansmor So you're from "Southern Maine"? It's a pretty delicious food, isn't it? A very appetizing meal! Enjoy!! @Weezilou peanut butter and jam (jelly) sandwiches are very popular here. The jam is often replaced by syrup. I have to say that traditional South African cuisine is quite diverse but very tasty. @salza I actually prefer jam, but I think "the traditional name" is because inexpensive grape jelly was often used on children's sandwiches. And while we might not use syrup very often as a substitute, honey is often substituted and Ken, like many people, likes pb and banana slices! Let's hear 3 cheers for food diversity! love peanut butter and banana. Had to look up what grits were. So interesting to hear about foods from other places. The tomatoes look pretty good too. oh, the food! how could i've forgotten about the food? yeah wait, i'll go down to pats for the lobster! excellent presentation, my lady! @Weezilou Thanks Louise, now I know. Sounds totally yummy to me. @Weezilou Forgot to day, PB is good with just about any thing, or on its own. Love it.